The AHA Charity Golf Tournament and Casino/Comedy Night Party will be returning to the beautiful golf course at the Arizona Grand Resort. The event features 18 holes of spectacular golf along with fun, interactive games and events. Each foursome includes green fees, cart & range balls, putting competition, boxed lunch, player gift bag and Casino Night Party. 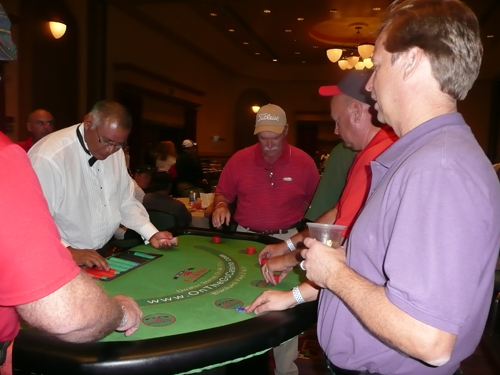 The Casino Dinner Party will feature a DJ and Comedy Show to kick it off followed by Casino Games (poker, craps, roulette and blackjack). Location: Arizona Grand Resort, 8000 S. Arizona Grand Parkway, Phoenix, AZ 85044. For more information and to purchase tickets visit Arizona Hemophilia Association or On the Go Casino® Parties Facebook Events or contact Melinda "MAC" McGuire Cisek at 602.955.3947 or mac@hemophilia.org.